Husband lost his job due 2 wife’s behaviour. Still wife gets 7000 p.m. as maintenance / MOOLAH !! Husband lost his job due 2 wife’s behaviour. Still wife gets 7000 p.m. as maintenance / MOOLAH !! This revisional application is directed against the order dated no. 11 dated May 19, 2015 passed by the learned Additional District Judge, First Court, Hooghly in Matrimonial Suit No. 628 of 2013 by which the application under Section 24 of the Hindu Marriage Act, 1955 is disposed of. The husband/petitioner filed the aforesaid suit under Section 12 of the Act for declaration that the marriage is a nullity. It fell from the learned Advocate for the petitioner that his client is a diploma holder and was at one point of time in gainful employment. According to him, the petitioner lost the job because of the behaviour of the wife/opposite party and is presently unemployed. In an application under Section 24 of the Act, the wife asserts that the monthly income of the husband is Rs.20,000/- per month which has not been denied by the husband/petitioner except that he is not presently in gainful employment. The petitioner is an able-bodied person and has a capacity to earn. If at one point of time he was earning a sum of Rs.20,000/- per month, the Court shall not deny the maintenance to the wife on the basis of the submission of the husband that he is not in employment. The Trial Court considered the status of the parties in the society and have further taken into account the prices of the essential commodities and directed the alimony pendente lite of Rs.7,000/- per month to be paid to the wife from the date of the order. The Trial Court appears to have taken a lenient approach in the matter in not directing the alimony to be paid from the date of the application. It appears that there is no issue from the said wedlock. This Court does not find that the sum of Rs.7,000/- towards the alimony is too excessive and not in commensurate with the income of the husband. This Court, therefore, does not find any grounds warranting the interference with the impugned order. The revisional application thus fails. No order as to costs. This entry was posted in divorce, Kolkatta HC, Maintenance and tagged divorce, jobless husband pays maintenance, Kolkatta HC, Maintenance on August 31, 2015 by vinayak. * filing criminal cases on husband and in laws, threatening them with arrest etc NOT elaborated !! Present: Mr. Sushil Bhardwaj, Advocate for the petitioner. Petitioner has filed this petition under Section 482 Cr.P.C seeking quashing of F.I.R No. 101 dated 5.4.2013 registered under Sections 498-A/506/323 IPC at Police Station, Bhawanikhera, District Bhiwani and all the subsequent proceedings arising therefrom on the basis of compromise. Learned counsel for the parties submit that during the pendency of this petition a compromise has been arrived at between the parties and dispute has been amicably settled. Relying upon the judgment reported as Kulwinder Singh and others Vs. State of Punjab, 2007 (3) RCR (Crl.) 1052, learned counsel submit that in view of compromise, the impugned F.I.R deserves to be quashed. Learned State counsel does not dispute the ratio of judgment in Kulwinder Singh’s case supra and submit that in case a compromise is arrived at between the parties the State shall not stand in the way of quashing of F.I.R. influence and thus they have no objection if the FIR is quashed. Resultantly, the present petition is allowed. The F.I.R in question and the subsequent proceedings arising therefrom are quashed. This entry was posted in 498a quash, FIR quash and tagged 498a, 498a quash, 506, file 498a etc and come to a quick compromise ! !, FIR Quash on August 30, 2015 by vinayak. ablaa takes 7.5lakhs & refuses mutual consent. Husband runs 2 HC who tells him 2 go file fresh case ! Again ladies and gentlemen, I am NOT making this up !!. This is all from reported Judgements of honourable courts !! 2. Learned counsel for the appellant submits that those all settlements arrived at between the parties have been reduced into writing and both the sides had agreed to go ahead with a petition under Section 13(b) of the Hindu Marriage Act. 3. Be that as it may, they all can be said to be a good ground for the appellant to move the court concerned once again seeking decree of divorce but not for the purposes of disturbing the impugned order. 4. Faced with this situation, counsel for the appellant states that he may be allowed to withdraw the instant appeal enabling the appellant-husband to file a fresh petition in the court concerned seeking decree of divorce on all the pleas available to him including the grounds taken herein. 6. Resultantly, the appeal, on hand, stands dismissed as withdrawn with the liberty aforesaid. This entry was posted in mutual consent divorce and tagged divorce, JHARKHAND HC, mutual consent divorce, wife refuses to sign after taking 7.5 lakhs for mutual consent !! on August 30, 2015 by vinayak. It’s just coincidental that we shared a path… ! should that make me a criminal ? * I was on my way, just like everyday in my life. * It’s coincidental / just fate that we took the same path. * What have I done to get this ? Please read those lines once again. This is NOT the Jasleen Kaur, Sarvjeet Singh story. This is the story of millions of husbands and their families. They are charged JUST on the words of a woman, many times no photos even !! It’s just their fate they got into marriage, they got into a gamble. This is BEYOND politics. This entry was posted in where is the evidence on August 27, 2015 by vinayak. SPEEDY JUSTICE for innocents ! a.k.a. inquiry commissions for retired judges !! SPEEDY JUSTICE and SAFETY of the innocents ! a.k.a. inquiry commissions for retired judges !! Violence, Gundagiri @ Hon Egmore MM court (Chennai) has been on news for quite some time. Attacks, and even one murder has happened within court premises. Groups of lawyers have clashed against each other, litigants terrorized etc all in broad daylight !! Criminal cases against such attacks is pending before Hon Madras HC for FOUR years !! 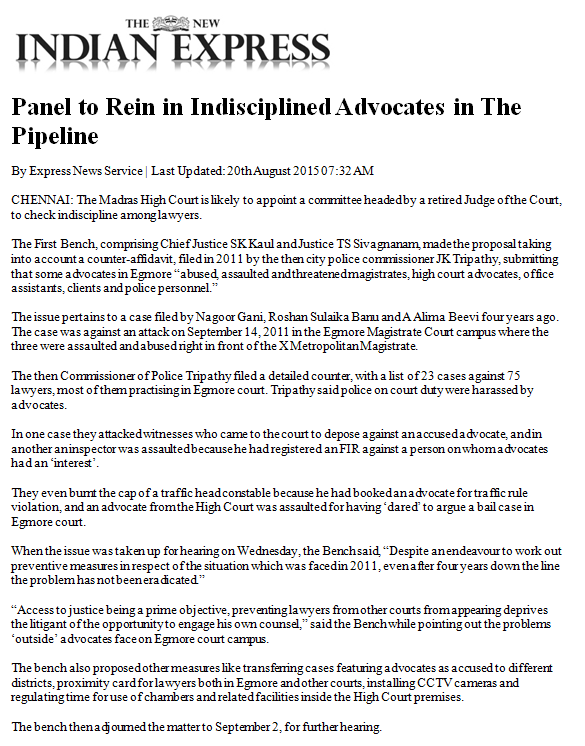 We understand that in this case, "…The then Commissioner of Police Mr. Tripathy filed a detailed counter, with a list of 23 cases against 75 lawyers, most of them practising in Egmore court. Mr. Tripathy said police on court duty were harassed by advocates…" !! Now (in Aug ’15) the court is planning to appoint AN inquiry commission to look into the matter !!! This entry was posted in where is the evidence on August 23, 2015 by vinayak.